The history of Temple Dowling can be quite confusing. When it was built in the pre-romanesque style of the 10th century, it was known as Temple Hurpan. In the 17th century the church was extended westward and a new roof added by Edmund Dowling, from whom the church now gets it's name. 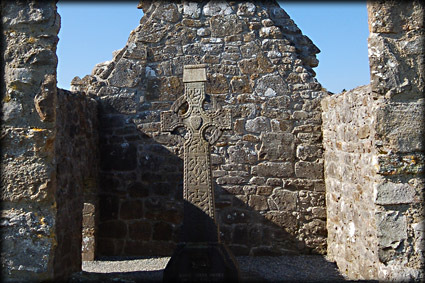 Dowling included non-functioning antae on the west gable to match that on the east, see in the image right. 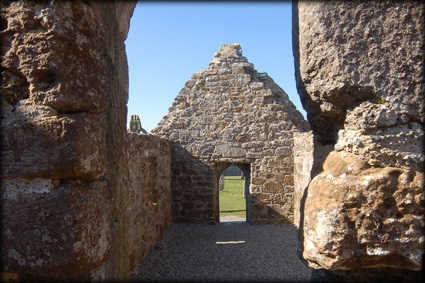 Even though the east gable was heightened it still retained the original round-headed window. Above the entrance is a plaque bearing the Dowling family crest. 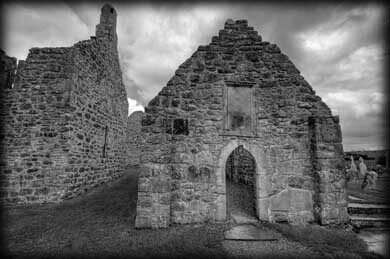 In the late 17th century an annex was built onto the west end of Temple Dowling. To confuse matters they then named this building Temple Hurpan. 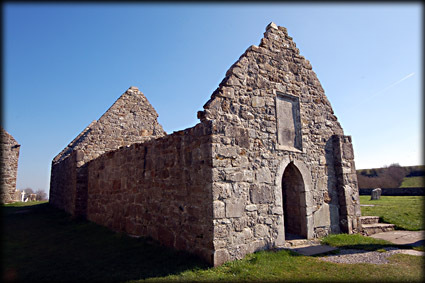 The building has a south doorway and a large window in the eastern gable. From what we can gather Temple Hurpan has never functioned as a church and was mainly used to bury members of the local parish. 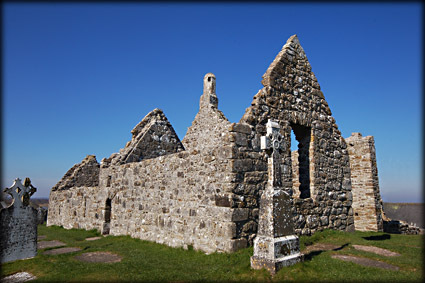 Since our last visit quite extensive restoration work had been carried out to most of the buildings at Clonmacnoise. The Banner image at the top of this page shows temple Dowling with Temple Hurpan behind it. with the Cathedral to the left and there is a replica of the south cross, marking it's original position in the foreground. 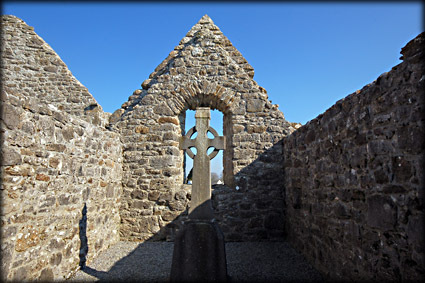 Situated: As you enter the monastic site from the visitor centre Temple Dowling/ Temple Hurpan are straight in front of you, on the southern side of the Cathedral. Discovery Map 47: N 009 306 Last visit Mar 2011.